There is a legend included in the pdf to explain the icons and colours. A new pdf with the civilisation info is included with the Age of Chivalry Hegemony download. Kor Bosch: provided me with the techtree-backgrounds and icons as well as additional information on changes to his mod. Lukas Chludzinski, herr-der-mails: helped me to create the techtrees and created additional icons and the pdf's. Leif Ericson: provided me with additional information and let me use his techtrees. anter175 you play on GameRanger? DJeronimo, I'm afraid, I can't help you with your problem. Hey herzog were do I put the files so that it changes the techtree in the game? Lanor, this is just a pdf-"manual", so they won't show up in the game. I'm not even sure if that is possible since the ingame techtrees couldn't be modified, afaik. If someone knows of a way to replace the ingame techtrees with those I made, post a suggestion. Finally! Clear techtrees for Age of Chivalry! This is very useful; you can quickly have a look at them while playing the game if you want to have some information (not in multiplayer of course). Pity these techtrees don't replace the techtrees in game. But that's probably impossible. Yeah... what else to say? Very good job! This is a must download if you are an Age of Chivalry-player. 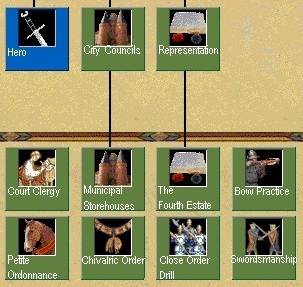 This download consists of a complete technology tree (and key) for all eighteen civilizations in Age of Chivalry: Hegemony. It is accurate to a fault, a considerable acheivement considering Hegemony's many twists and turns. The tech tree is in PDF form, which requires users to alt-tab out of the game to consult it, but this is a minor inconvienence by comparison to the many benefits it provides. Although the online tech tree is not completely out of whack, it was indeed screwed up by the ultra-complex modifications that make up Hegemony. This does not fix that problem (and indeed, there is no known solution to it), but it alleviates the problem of not knowing a civ's abilities. Overall, perhaps the most highly useful document created specifically for Hegemony I have ever seen. We hope to see other things for Hegemony crop up at the Blacksmith at a later time. For now, we have this, a brilliant and incredibly helpful piece of work. P.S. : Kudos to Leif Ericson for creating the base for this file. Thanks for the reviews, king and jordan. I really appreciate that.